A little while ago a received a package from the lovely Chris of Lacquer Ware for Tips and Toes. She sent me some frankens and few other polishes. One of the frankens she made for me I helped name Ring of Fire. This is my kind of color! I'm so happy she sent this to me. Thank you! Ring of Fire is a true red jelly jam packed with gold glitter. This color is great! It combines two of my favorite things red and gold. It's unlike other red/gold combinations I've seen in polishes before. I love the perfect balance of jelly and glitter. This color is hot and literally on fire. Chris is the franken queen! She has the magic touch when it comes to frankens. They're gorgeous. Stunning! This is so perfect for the holidays. *In Bloat voice* RING OF FIRE!!! I love a bright red polish! And this one has glitter. Score! Chris has it goin' on! 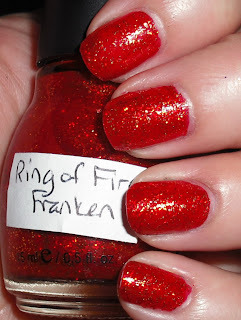 What a lovely Franken for the holidays. But, even for every day use too. I remember seeing this on her blog post about making it. She's awesome at frankening and the polish looks lovely on you! Looks a little bit like ruby pumps. Amazing! This is fabulous! It looks like it has both glitter and glass flecks, it's totally blingtastic!